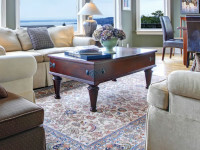 Fine rug cleaning requires specialized treatment by trained, professional technicians. At Hi-Tech Cleaning Services, our technicians are qualified to gently but effectively clean your rug without causing damage to the delicate fibers. We analyze your rug for its unique qualities and needs and then use the appropriate equipment and high-quality cleaners to remove ground in dirt, debris, allergens, and other pollutants that detract from the elegance of your rugs. Your rug can look like new again, with our fine rug cleaning service. Contact us online 24/7 or call (914) 423-4600 to learn more about fine rug cleaning, specialty cleaning, stone and tile restoration, and our emergency damage removal services in Westchester County, Yonkers and the NYC Area.